Rodeo is about to get CRAZY!!! The biggest weekend in rodeo is called Cowboy Christmas which happens on 4th of July weekend every year and that weekend is coming up! The most prize money handed out. The best cowboy and cowgirl contestants. Everybody, and I mean EVERYBODY, is on their A-Game for America’s birthday as this weekend alone could catapult a cowboy or girl into the top of the National Finals Rodeo standings. I’m here to help you reach your A-Game through nutrition for Cowboy Christmas. I was ECSTATIC when the Miss Rodeo America Facebook page posted a blog post this past week featuring the personal trainer of Lauren Heaton, the current Miss Rodeo America. If you follow cowboys like Bobby Mote, AJ Colletti, Tuf Cooper, and Trevor Brazile on social media sites, you will see that the amount of attention to the health and fitness of rodeo competitors has exponentially grown. Like other rough and tumble sports, contestants are realizing that with the proper physical care and attention to the fuel that they put in their body, they can push themselves past their competition. This is also true for rodeo queens whether they are currently holding a title or planning to try out for one. Regular pageants are huge on trainers and health, but I feel as if it’s overlooked in the rodeo queen business. 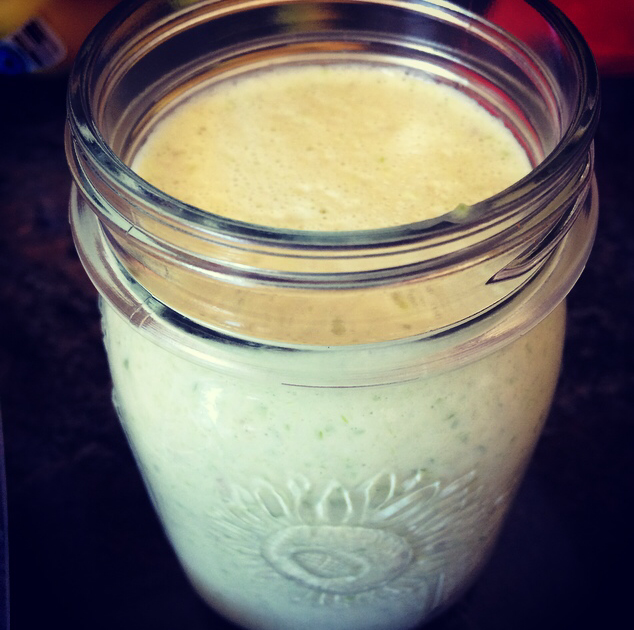 Everyone is busy and I want to share how you can change your world, save money and feel better about yourself with some simple pre-rodeo weekend meal prep. Whether you are a rodeo contestant, queen, judge, barrel man, cowboy lifesaver, stock contractor or avid fan, you will be able to use this meal plan to help you attain a healthier 4th of July weekend. Ranchers and farmers always have a surplus of mason jars around, especially this time of year as we are waiting for fruits and vegetables to ripen for preserving. 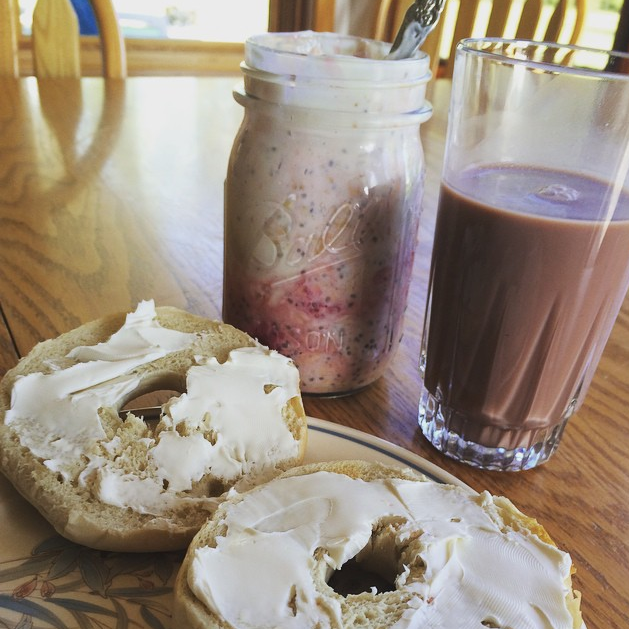 It’s time to bust those mason jars out, get’em cleaned up and be ready for some delicious breakfast. Optional: I also add 1 scoop of MultiPure Mixed Berry which is a powder I get from Complete Nutrition that includes essential daily vitamins & minerals, superfood blend with 50 fruits and vegetables, and probiotics for healthy digestion. Ingredients marked with an asterisk (*) mean that I buy in the bulk section; saves you a ton of money! Layer the ingredients oatmeal first, other ingredients second, and then I pour the milk over the too to get everything marinating alright. Put the lid on, shake it up, and put it in the refrigerator. Since our 4th of July weekend is going to be crazy (like 3 rodeo performances a day), make up your hard with everything but the wet ingredients before you leave and then leave them in the refrigerator (for the fruits sake!). When it’s the night before, all you have to do is add the wet ingredients and you are good to go! Here are some options for items to prepackage to take as snacks; place them in ziplock baggies, jars or Tupperware containers in your average portion size so that all you have to do is grab them and go! Fruit cups: apples, grapes, cantaloupe, melon, watermelon, pineapple, bananas, mango, kiwi, strawberries, blackberries, blueberries, raspberries, pears, etc. If you get sugar cravings toss fruit with agave sauce (a natural sweetener) and your cravings will be satisfied without damage to your health. Trail Mix: either homemade, made at the grocery store at a DIY stand, or purchased. Sliced Vegetables: carrots, cucumbers, bell peppers, etc. About 20 Brussel sprouts; I get the bag from the grocery store instead of hand selecting. Slice the Brussel sprouts into thin 1/8″ thick strips. 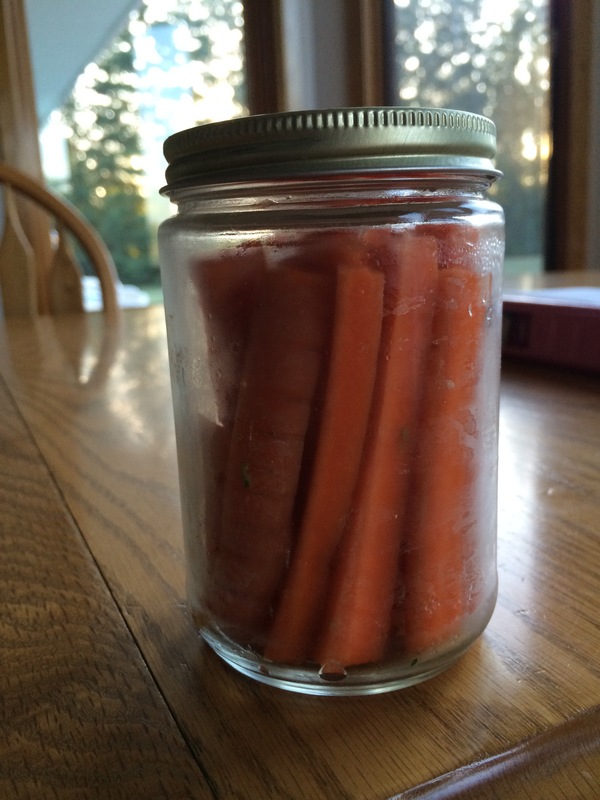 Slice carrots into thin medallions. Toss carrots and Brussel sprouts in extra virgin Olive oil (EVOO) or coconut oil. I seasoned with Flavor God’s Everything Spicy seasoning and Garlic Lovers seasoning but you can use salt, pepper, garlic powder, onion powder, paprika, and parsley as a substitute. Sauté over medium heat for about 12 minutes or so, you are looking for bright, vibrant color. Take the lab off the burner and scoop portions into the Tupperware or glass containers; should fi about 6 containers. Cook rice in water and chicken broth liquid. Stir in a teaspoon of Flavor God Everything Seasoning (substitute garlic powder, paprika, parsley and pepper) before starting the cooking process. I use a rice maker but you can do it the “old fashioned” way in a saucepan if you don’t have one. I had two different types of protein: shrimp & chicken. For the shrimp, I placed them in a non-stick frying pan with EVOO, lemon juice, and Flavor God’s Lemon & Pepper seasoning (basil, parsley, and oregano for the substitute). Cook them until they are just barely pink all the way through; nothing is worse than dry shrimp *blech*! For the chicken I cheated and will get an organic rotisserie chicken, this can be picked up at the rodeo (from a local grocery store obviously) and then deconstructed while warm and delicious into your re-heated veggies and rice. So easy right? 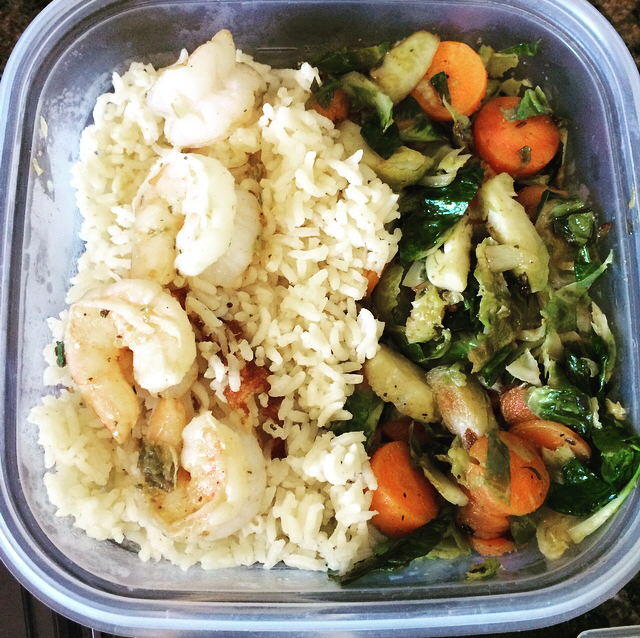 Place a scoop of rice, a scoop of vegetables, and about 4 shrimp in containers. The leftover shrimp can be used with the pasta you will make later. Cook the rice like the previous meal. Rice is an easy to starch to use because it fits into the non-gluten dietary restrictions as well as reheats well. If you have problems reheating rice, try adding a sliver of butter or drizzle of EVOO on top before microwaving. You can always add mushrooms or other vegetables to rice to make it a risotto (saving that recipe for later). If you don’t want rice twice (I used it because I could make it as one big batch at once), you can make a couscous or quinoa instead. Preheat the oven to 375 degrees Fahrenheit. Slice salmon into portion sized pieces and place skin side down (I leave the skin on because it’s easier to remove after it’s been cooked) onto a foil lined, lipped baking tray (easy to clean up). Top with lemon juice, EVOO, and Flavor God Lemon & Pepper seasoning. Cover with foil, making a slight tent. Bake for 15 minutes; it will be just cooked all the way through. You can purchase salmon either from the grocer/deli/market or, if you are lucky, you will have family members (or yourself) who go fishing and you already have some in your freezer; just make sure they Re de thawed before you start! Place 1.5-2.0 inches of lightly salted water in a deep frying pan; bring to a boil. Cut the bottom inch off the asparagus, save for later, and place the tops of the asparagus into the boiling water. Cook for 5 minutes until tender. Drain asparagus and replace empty frying pan onto the burner. Place about 2 tablespoons of sesame seeds in pan over medium-high heat toast for about 4 minutes or so; you will be able to smell them. Add EVOO and a splash of soy sauce to the pan before adding the asparagus back in; you will be crisping the outside of the asparagus making it crunchy on the outside and soft on the inside. 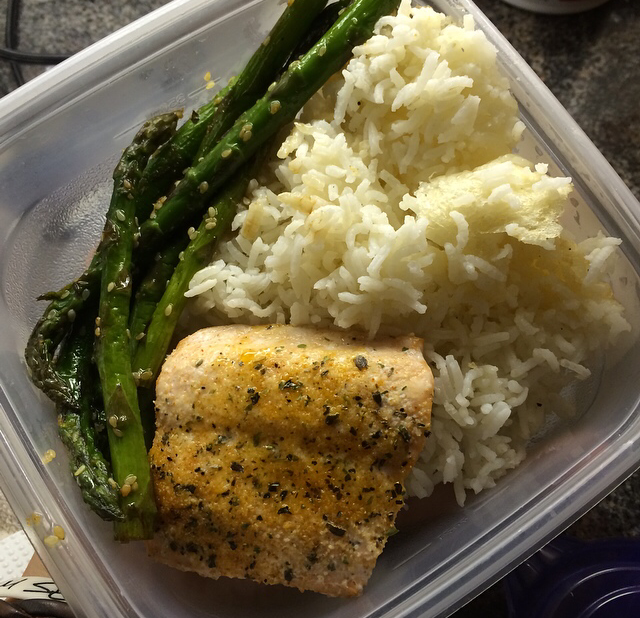 Place rice, salmon portion (skin removed), and about 4-6 asparagus stalls in each meal prep container. Make sure your food has cooled before you cover it and place it in the refrigerator. Remember the ends of the asparagus that you cut off? I hate wasting so what you are going to do is bring some salted water to a boil, place the asparagus ends in the water and cook for about 5 minutes. Drain and place the asparagus ends in a blender. Heat the heavy whipping cream, chicken broth and garlic cloves in a small saucepan over high heat to a boil. Once boiling, remove from heat and stir in cream cheese and Parmesan cheese. Place back on the stovetop occasionally to keep the contents to a cheese-melting temperature. Once it’s all close to being melted you can remove the garlic (I leave it, I LOVE the taste of garlic) and place the cream mixture into the blender with the asparagus. Blend until smooth. I then store the asparagus Alfredo sauce in a mason jar (don’t mind the tin foil lid, I couldn’t find any for the moment) for easy traveling. I would suggest making a whole grain pasta to continue your health trend but you can use whatever pasta you want. If you have the capabilities, cook the pasta at the to for before you make this meal. If you are worried about time, you can cook the pasta before hand and then, a trick I learned catering, you can place the pasta in boiling water for a minute or so to shock it back to full health. Otherwise cook the pasta ahead of time, toss in EVOO or butter, and then place in a Tupperware for reheating. If you haven’t figured it out yet, the chicken you are going to use is the rotisserie chicken that you purchased at the rodeo. If you have leftover shrimp, toss them in as well!! I also eat the chicken and shrimp with avocado, cheese and spinach in whole grain bread sandwiches as well. As crazy as it sounds, I do suggest that you go out to eat for lunch or dinner, on one or two of the days. 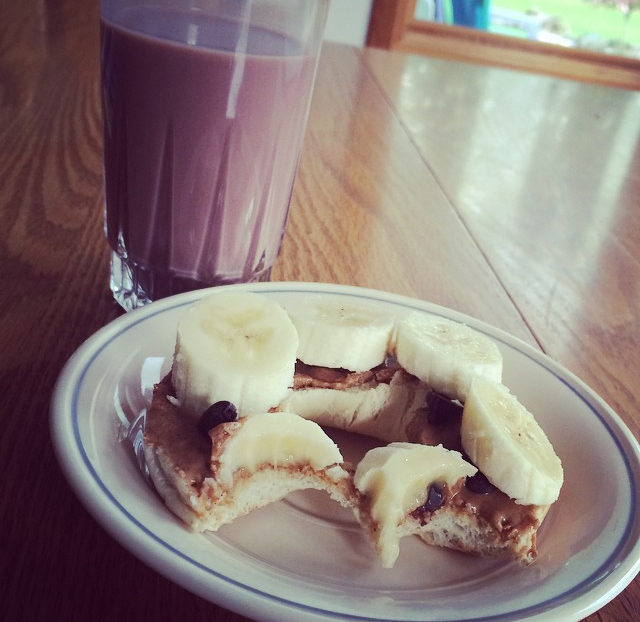 You need to mix up your days and your meals. I really do believe that good brings people together. Get together with people from the rodeo and try out a local restaurant or dive. Heck even a food truck! Always a good memory no matter the outcome!! Enjoy the experience of the rodeo road. You are getting the opportunity to live the gypsy rodeo lifestyle that so many people can only romanticize about these days (especially after the Longest a Ride – shoutout to Nicholas Sparkes! ).